My husband loved this dish so much that when I started to grind some up for our 10 month old he said, "Maybe you should just feed her baby food." After a questioning look from me he explained that this was just too good for a little person who doesn't always finish her dinner, and really doesn't appreciate how good it is. I assured him that there would be plenty for his lunch the next day...and although his daughter is only 10 months old, she does appreciate good food. She gobbled up her dinner like a champ, eating more than usual. It must be a winner! 1. Season the chicken breasts with salt & pepper. 2. In a large skilled heat the olive oil on high heat. Sear the chicken breast for 2-3 minutes on each side. The chicken will not be cooked through. Remove from the heat and set aside. 3. In the same skillet, melt 2 T. butter or margarine. Cook the green onions in the butter until tender. 4. Stir in the flour, salt and pepper. Mix until flour has been absorbed. 5. Add milk and chicken stock, stirring until it starts to thicken. 6. Add ham, vegetables and ½ C. of the Parmesan cheese. Stir until cheese is melted. 7. Arrange seared chicken breasts in the bottom of a medium baking dish that has been sprayed with non-stick cooking spray. 8. Poor the cream sauce over the chicken. 9. In a small bowl combine the remaining Parmesan cheese and bread crumbs, mix well. 10. Sprinkle bread crumb mixture evenly over entire dish. 11. Bake uncovered at 350 degrees for 35-45 minutes. *If you don’t like cauliflower, you can use all broccoli, or the other way around. 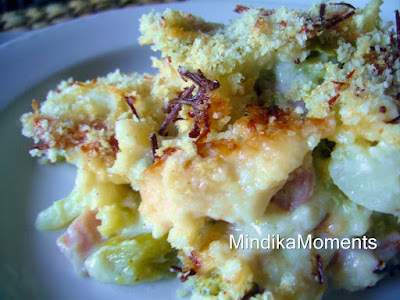 This looks so much faster and easier to make than the traditional chicken cordon bleu! ummmmm yum!!!! looks so good.